Caroline Augusta was a Bavarian princess who became Empress of Austria thanks to an arranged marriage with Emperor Francis I. Much younger than her husband, she became a “second mother” to Francis’s grandson, Franz, who happened to be Napoleon’s son, Napoleon II. Pious, well-educated and good-hearted, Caroline tried to bring warmth and enlightenment to the boy’s life in the Viennese court. 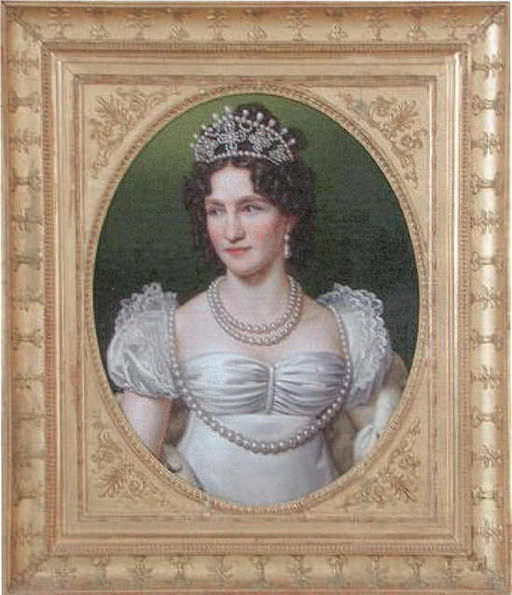 Caroline Augusta of Bavaria was born in Mannheim to a German noble family on February 8, 1792. Her mother, Princess Augusta Wilhelmine of Hesse-Darmstadt, died when Caroline was four years old. Her father Maximilian, a member of the Bavarian House of Wittelsbach and a general in the Austrian army, remarried. In 1806, due to an alliance with Napoleon Bonaparte, he became King of Bavaria. The elevation of Bavaria to a kingdom was part of a bargain in which Caroline’s older sister Augusta married Napoleon’s stepson, Eugène de Beauharnais, the son of Napoleon’s first wife, Josephine. Caroline Augusta’s marriage was also arranged, at age 16, to 26-year old Prince William of Württemberg. They wed on June 8, 1808 in Munich. Her husband regarded it as a purely political match and reportedly told Caroline that they were victims of politics. He avoided her as much as possible, and the marriage was never consummated. In 1814, once Napoleon’s abdication rendered the reason for the union moot, the marriage was annulled. This left Caroline, a devout Catholic, free to marry again without the threat of excommunication. Caroline Augusta’s second match was also a political marriage, but a step up. On October 29, 1816, at the Church of St. Augustin in Vienna, she married Francis I, Emperor of Austria and King of Hungary and Bohemia. She was Francis’s fourth wife, and 24 years his junior. Having three times become a widower, Francis thought he deserved a younger wife. His brother, Grand Duke Ferdinand III of Tuscany, was also vying for Caroline Augusta’s hand. Britain’s ambassador to Austria, Charles Stewart, described Caroline Augusta to British Foreign Minister Lord Castlereagh as follows. The new Empress was popular with the Austrian people. She took an interest in their welfare, founding several hospitals and residences for the poor. Under the influence of her religiosity, a devotional air pervaded the court. Caroline Augusta took a keen interest in Franz’s education. She – along with her husband – liked to sit in on his exams. Whether Franz enjoyed this attention is hard to say. We catch glimpses of Caroline Augusta in his diary, as in this entry of August 23, 1823. Neither Caroline Augusta, nor the Emperor, were with their grandson when he died in 1832 at the age of 21 (see “The Death of Napoleon’s son, the Duke of Reichstadt”). Emperor Francis died three years later, leaving Caroline Augusta a widow at the age of 43. Melanie Metternich, the wife of Austrian Chancellor and Foreign Minister Clemens von Metternich, described visiting the bereaved Empress on April 7, 1835. Caroline Augusta became the Empress Dowager of Austria. She remained close to the imperial household, especially since her half-sister, Sophie, was married to Francis’s son, the Archduke Franz Karl. Their son, Franz Joseph, ascended the imperial throne in 1848. Caroline Augusta died on February 9, 1873, one day after her 81st birthday. She is buried in the Imperial crypt of the Capuchin Church in Vienna. Sabine Freitag and Peter Wende, eds., British Envoys to Germany, 1816-1866, Vol. 1 (Cambridge, 2000), p. 470. Edward de Wertheimer, The Duke of Reichstadt (London, 1906), p. 291. Guillaume-Isidore de Montbel, Le Duc de Reichstadt (Paris, 1836), p. 130. Jean de Bourgoing, Papiers Intimes et Journal du Duc de Reichstadt (Paris, 1927), pp. 61-62. Montbel, Le Duc de Reichstadt, p. 238. Richard Metternich, ed., Mémoires, Documents et Écrits Divers laissés par le Prince de Metternich, Vol. 6 (Paris, 1884), p. 11. Thank you for the article about Napoleon II “second mother”. I am particularly interested in material concerning Napoleon’s son. I love your blog! Thank you for such interesting details. I am almost done reading your book – it’s been a good read. Thank you, Jean. I’m so glad you’re enjoying both the book and the blog. I, too, find Napoleon’s son fascinating. It’s a shame he died so young. I’d like to think his life wasn’t entirely sad, given he was well-loved in Austria. I am trying to find out who was this powerful woman that held the title of Archbishop in Austria and became well known throughout Europe. She was born a hero, commoner and rose to great power and prestige because of her spiritual powers. return and would be a source of trouble for them. Did she addressed the marvelous legacy which is a powerful and mystical secret that has an unlimited store of wealth and hid it away from prying eyes centuries. What was her mystical secret? Does her spirit or incarnation still exist today? If so, please explain. I await your reply. Empress Caroline Augusta of Austria was not born a commoner and did not hold the title of Archbishop, Betty. I don’t know of the woman you’re referring to. I am happy to see there is interest in the life of Napoleon II. I’m working on a biography of Madame de Montesqiou, his French governess. That’s great, Mary. She’s an interesting person.